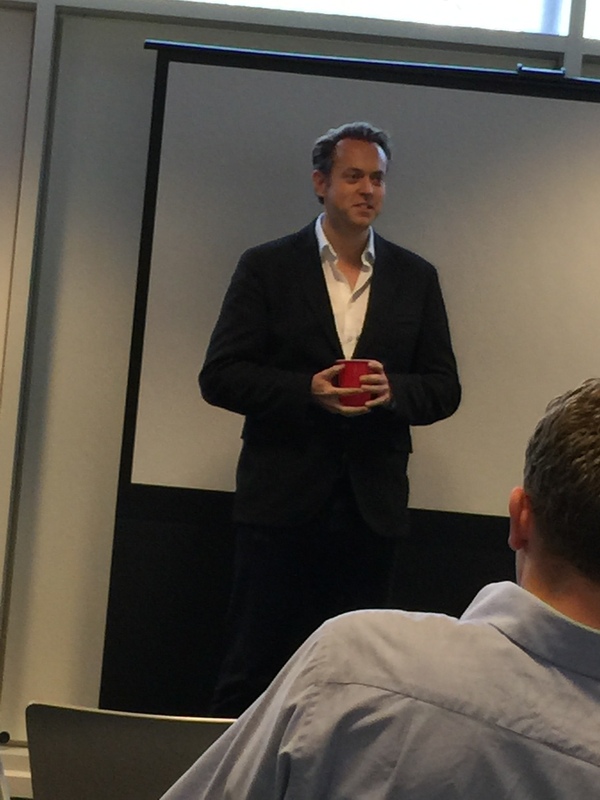 Last week, I attended just a few of the amazing talks at The Festival of Digital Disruption (#FoDD2015), at ConnectTVT (connecting Thames Valley start ups) at the GROW at Green Park hub space. Great speakers – I believe they had organised 21 speakers in a week, and all free. One topic thread that resonated strongly with me – present in many talks as a sub-text – was the changed landscape in terms of data usage. It wasn’t in the context of data specifically that Brent Hoberman suggested that the days of ‘act first, ask permission later’ are over. But given the other talks I saw that week, it’s one of the areas where it most applies. And as ‘Big Data’ is a huge topic right now, it’s one that surfaces regularly (largely in the context of how ‘anonymous’ data can really be). Increasingly, the public is sleepwalking into situations where if they’re not paying to use a service, they ARE the service – think Facebook, Twitter, online clothes shopping, search engines etc. These businesses are constantly, quietly, collecting data and learning about us constantly in the background. Mostly people are wising up to ‘free’ services. However, there are businesses that charge, and still use their data in order to provide their service. Think recruitment. Think dating services. Think media properties that dynamically change what you’re shown on the basis of where you are and what you’ve looked for previously. For the most part, this data collection and use serves us well. I don’t want to waste time searching, or to fall in love with a dress online that doesn’t come in my size, a man who lives on the other side of the World, or an event that I can’t attend. But the misuse of that data is becoming increasingly common. One of the early speakers in the week, Ross Williams, the Thames Valley entrepreneur who runs Global Personals, offered a good example of this. Global Personals is the name behind many dating and ‘social discovery’ websites ranging from niche dating sites to major brands in the dating game. Users’ personal data is piped across all of their many sites – 15 thousand of them, according to their website – and shown to any match on any of those sites meeting the right criteria. This means that a Global Personals’ dating site has a pretty high chance of connecting users – and it uses it’s filters to ensure that you are only ‘served’ people with the criteria that you’ve specified. Apparently on Valentine’s Day 2013, Global Personals welcomed its 20 millionth member, So far, great for the user. But the company attracts masses of bad publicity. Channel Four suggested that they were employing people to falsely complete dating profiles. But also behind many of the other complaints lies that n their terms and conditions is a clause that personal information can go across the many sites. Whilst it’s the very thing that creates more matches, making personal data public in unexpected places creates a lot of angry customers – given the stigma of admitting to online dating. probably more angry customers than have been brave enough to speak up. It’s sometimes aggressive competition that makes people/companies behave unthinkingly, or badly or/unethically.We see it with other dating services that don’t let people remove details from their profiles until the end of their paid term. We witness it with social media platforms that don’t remove dormant accounts. We see it with ‘collaboration’ services that sign people up but do nothing further. We see it with companies in competitive fields trying to rank on search engines. They want their numbers to stack. Regulation almost always follows in consequence, leading to ever more inventive ways to ‘pull one over’. So for me at least, Hoberman is ‘bang on the money’. With social media openly sharing companies’ minutiae from within, and people – including the media – demanding more transparency, ethics have never been more firmly on the table. I don’t mean we all have to be ‘goody two shoes’. If you walk into McDonalds, you don’t expect a gourmet meal – you expect standard food, served fast and politely. If you buy ‘a slag of a snack’ you know it’s not wholesome/organic. If you fly with Ryan Air, you don’t expect silver service. If you bet, expect to lose. It’s about brand expectations- these organisations will always have detractors, but not because they failed to deliver on promises. For The Care Locker, the openness of data in particular has some serious implications. We will be handling data that needs to be made public to specific users (just like a dating site). We will be holding references and rankings for our staff. Different staff will earn different (market plus) rates for the same job because they live in a different area. We may need to give carers details of difficult patients to allow them to make informed decisions about whether to take an assignment. The questions we are asking are who sees what, when, and how transparent can/should we make this? – ‘whistleblowing’ procedures that actually work. So here are my questions to you. What can we be building into The Care Locker’s systems to ensure transparency AND prevent data abuse? (A reminder that The Care Locker will be matching ‘agency’ care workers with the places that need them.) We’re building it now, so it’s a great time to have your say. What’s been your experience on other ‘matching’ sites, be they employment, dating, whatever? What do we need to learn and prevent happening – or include because it’s a wonderful example of great practise? You can email me personally (claire @ carelocker.co.uk) or reply publicly below. It’s an important ethical consideration, and your voice will be hugely valued. Updated May 2, 2015 to remove duplicated sentence.